What is the difference between pH and acidity? Why are scientists concerned about such a seemingly small change in ocean pH? Basic: Ocean acidification (OA) is a long-term decrease in the pH of ocean water. Wastes from some human activities, like carbon dioxide (CO2) from fossil fuel use, are causing OA around the world today. Intermediate: International experts define ocean acidification (OA) as a decrease in ocean pH over decades or more that is caused primarily by uptake of CO2 from the atmosphere. Because human activities are releasing CO2 into the atmosphere very quickly, the ocean is taking up CO2faster today than it has in the past. This is causing global ocean chemistry to change more quickly than ocean systems can handle. Figure 1: pH measures the acidity of a liquid. (a) The pH scale, with examples of common solutions and their pH values. (b) The pH scale is logarithmic, meaning that a change of one pH unit represents an order of magnitude change in the hydrogen ion (H+) concentration. Here the hydrogen ion concentrations are shown in both scientific notation and decimal form. (c) The percent change in acidity with falling pH values is calculated as the percent change in hydrogen ion (H+) concentration relative to the starting concentration. In this figure, the concentrations of H+ ions are shown in decimal notation (middle column) for every tenth of a pH unit from 8.2 down to 7.2. The numbers in the percent change in acidity column reflect the percent increase in H+ concentrations between the starting point (8.2) and each successive number. Average global surface ocean pH has already fallen from a pre-industrial value of 8.21 to 8.10, corresponding to an increase in acidity of 28.8%. Values of 7.8–7.9 are expected by 2100, representing a 100–150% increase in acidity. Basic: Many organisms on land and in the oceans are very sensitive to small changes in pH. Marine organisms that are used to stable seawater chemistry will experience changing conditions because of ocean acidification. Research shows that this change could harm certain species. Misunderstanding: Percent change in acidity isn’t the same as percent change in pH. When acid is added to a solution, the concentration of hydrogen ions (acidity) increases, and the pH decreases. People frequently confuse pH with acidity—pH is the scale on which acidity is expressed, but it is not the same as acidity. We can correctly compare the acidity at two different pH values by expressing the relative percentage change of the H+ concentration between the two pH levels, as in Figure 1. 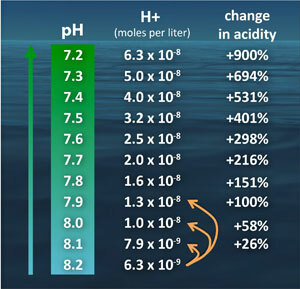 For example, the present pH decrease of 0.11 from ocean acidification equals a 28.8% change in acidity (H+ concentration) when calculated in this way. 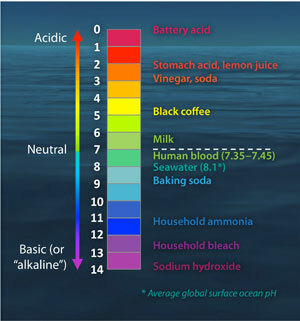 Misunderstanding: Liquids with high pH values don’t have acidity; they only have alkalinity. 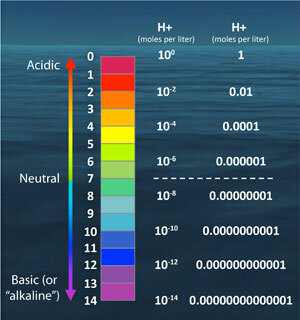 pH values above 7 are commonly referred to as “basic” or “alkaline.” These common terms can be confusing, because pH values do not directly measure the concentration of bases in the solution. pH values above 7 still measure the acidity of that liquid, but in that case, the liquid’s acidity (H+ concentration) is very, very low (less than 10-7 (or 0.0000001) moles per liter, to be specific). High pH values also do not measure alkalinity. Alkalinity actually measures the acid neutralization capacity of seawater. To determine the alkalinity of a solution, a separate, detailed laboratory analysis must be done. It is incorrect to characterize the change in hydrogen ion concentration as a decrease in alkalinity. Misunderstanding: Calling this phenomenon “ocean acidification” when surface seawater will remain “basic” under future emissions scenarios is alarmist. Just as we describe an increase in temperature from -20°C to 0°C as warming, even though neither the starting nor the ending temperature is “warm,” the term “acidification” describes the increase in the level of acidity in the global oceans. Both “warming” and “acidification” do not refer to absolute end points. When CO2 is added to seawater, it reacts with water to form carbonic acid (H2CO3). Therefore, acid is being added to seawater, which is acidifying it. Misunderstanding: Because natural pH variability is greater than long-term pH change, ocean acidification is nothing to worry about. Carbon dioxide (CO2) naturally exchanges between the atmosphere and the surface of the ocean. The CO2 content of the upper ocean has been increasing in parallel with the CO2 in the atmosphere since the Industrial Revolution, with the rate of increase becoming more rapid over the last half century as human-caused CO2 emissions have accelerated. When CO2 dissolves in seawater, it has several consequences for the chemistry of the seawater. Some of the CO2 that dissolves in seawater will remain in the form of a dissolved gas that can freely exchange with the atmosphere and be taken up directly by marine plants and phytoplankton. This fraction is usually referred to as dissolved or aqueous carbon dioxide, and it is typically expressed as the partial pressure of CO2 [abbreviated pCO2, in units of microatmospheres (µatm)]. When acids are dissolved in water, they “dissociate,” which means that they break apart into their constituent ions, in this case a hydrogen ion (H+) and a bicarbonate ion (HCO3-, as is found in baking soda). At typical seawater pH values, some of the hydrogen ions will remain as hydrogen ions, thus increasing the acidity and lowering the pH of the seawater. However, most of the hydrogen ions created through the previous reaction will subsequently combine with carbonate ions (CO32-) to form additional bicarbonate ions, thereby reducing the pool of carbonate ions. In summary, the chemical changes in seawater resulting from increased atmospheric CO2 concentrations include increases in the concentrations of dissolved (or aqueous) carbon dioxide, hydrogen ions, and bicarbonate ions, and decreases in the carbonate ion concentration and pH. Figure 2: Chemistry of ocean acidification. As carbon dioxide (CO2) dissolves into seawater (left), it creates carbonic acid (right). 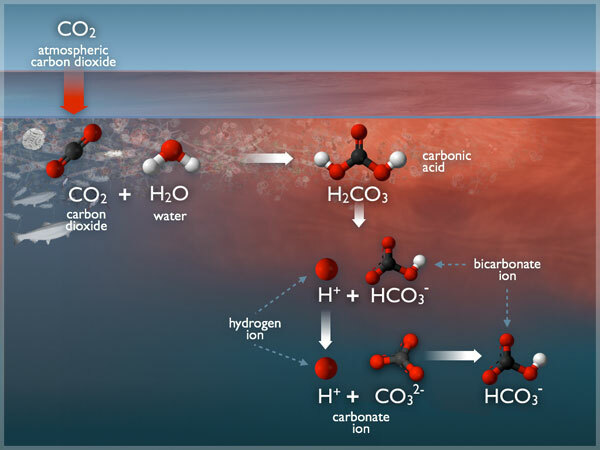 Through a series of chemical reactions, carbonic acid releases hydrogen ions (H+), which decreases seawater pH, and decreases the concentration of carbonate ions (CO32-), which provide chemical building blocks for marine organisms’ shells and skeletons. In the above equation, form refers to the specific crystal type of calcium carbonate the organism makes. Different crystal forms include aragonite, calcite, or amorphous calcium carbonate. The term Ksp’ is the “apparent solubility product.” This simply indicates the solubility of that type of calcium carbonate at the actual temperature, salinity, and depth of interest. At omega values greater than one, calcium carbonate is supersaturated, meaning that shell-building should be relatively easy and calcium carbonate structures will stay intact. At omega values below one, conditions are undersaturated, meaning that shell-building would be more difficult and the seawater would naturally break down that type of solid calcium carbonate. A value of one for omega indicates that the saturation state is at a threshold between solid calcium carbonate being favored (above one) and dissolved ions being favored (below one). However, it is critical to note that saturation state is a chemical index, and different organisms have a wide range of tolerances to saturation states. Scientists are just beginning to learn more about the biological thresholds of different species. Although knowing the exact value of the saturation state will not necessarily help predict how a particular organism will respond, saturation state is a helpful chemical measure that can allow scientists to compare sensitivity across species and in varied environments. Having such a universal measure is key for letting us understand and predict how species that are ecologically or economically important will be affected by ocean acidification.